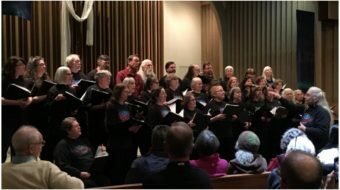 ST. PAUL, Minn. (PAI)–The 10 or so people gathering in a home in St. Paul might have been meeting for the first time, but they forged an instant bond. Their parents or grandparents 80 years ago stood together and fought in the streets of Minneapolis for the right to organize a union during 1934’s Teamster strikes. These descendants included the grandchildren of notable strike leaders like Vincent “Ray” Dunne. They also included people who knew little about their parents’ or grandparents’ involvement – only that daddy or grandpa took part and that it was damned important. One by one, as they shared their stories, the descendants also expressed a common calling in life: To stand up for what’s right and to work to make the world a better place. Her grandfather died before she was born, but she heard stories about him and about the strike from her grandmother. 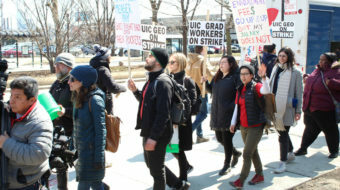 “I’ve been part of organizing a couple of unions myself,” she related, and until a couple of years ago she was an active member of SEIU Local 26. “My dad was one of the original coal truck drivers that went out on strike in February 1934,” said Rosemary Knutson of Minneapolis. She shared photos of her dad, Christ Knutson. In one photo he is in his World War I uniform. (He fought in the trenches in France under General John J. Pershing). In another photo, Christ Knutson is posing with a group of coal truck drivers and company owners. She said her father told stories about “bodies stacked like cordwood” in France. On July 20, 1934 he was present for “Bloody Friday,” she said, when police shot and killed two strikers and wounded 60 – but he didn’t talk about it. Knutson lives that ethic and has been a very active neighborhood volunteer and leader in the Cedar-Riverside area. “My grandfather and grandmother were involved,” said Shelly Zien of Minneapolis. Her grandparents, Mo and Rose Hork, were interviewed and featured prominently in a 1981 documentary film about the 1934 strike, Labor’s Turning Point. At the time of the strike, her grandparents had two children. While Mo Hork served on the Committee of 100, Rose Hork helped with organizing food and medical care for strikers and their families. “It is part of my family history and I want our kids to know it. We’ve been doing some research into…old newspapers and so forth. It’s fun to see my grandfather’s name. “I know through family stories times were hard, people were desperate…people were hungry, people needed work,” said Colleen Casey, talking about the 1930s. “There was help to get them through. Everybody pitched in and helped each other out.” Her maternal grandfather was Edward “Al” Nass, a truck driver involved in the 1934 strike. Casey’s mother was born June 8, 1934, in the middle of the tumult of the Teamsters strikes. As a child, Casey said, her grandparents took her to all parks in Minneapolis, in order to play with kids from different backgrounds. “They wanted us to have their ideals,” she said. “What I know is kind of limited,” said Tim Ahern. His grandfather, Walter Ahern, and Walter’s brother Arthur Ahern both worked for the Glendenning trucking company and were involved in the 1934 strike. Walter Ahern was a warehouse worker. “It’s nice to know grandpa was there,” Ahern said. Ahern said his grandfather, who was born in 1908, was 26 at the time of the strike and was married. “I wish we knew more but we don’t. It would have been nice to talk to grandpa – but that’s the way life works.” Ahern said, “he gave me colorful stories” but not stories about the 1934 strike. Walter Ahern died in 1992. “My grandfather was Vincent Raymond Dunne,” said Linda Leighton of Hopkins. V.R. Dunne, with brothers Grant Dunne and Miles Dunne, was one of the leaders of the 1934 strike. “He died in 1973 when I was 23,” Leighton said. “My grandfather was a big part of my life. We saw him regularly. “I was always aware of what my grandfather had done and stood for,” Leighton said, although she doesn’t remember her grandfather talking about the 1934 strike. Over the years, she has learned more about his role in the strike and his continuing activism as a leader of the Socialist Workers Party. “I recently was given a transcript of his trial in 1940,” she said (V.R. Dunne was sentenced to 16 months in Sandstone prison for his radical political views). “I can just see him saying the things that were said in the trial. He really cared about people. He wanted everybody to have a break. Leighton is a member of Service Employees International Union Local 284 and union steward. She works as a media paraprofessional for the Hopkins school district. David Sundeen, three years younger than his sister Linda Leighton, also described a close connection with their grandfather, 1934 strike leader V.R. Dunne. “I can see and hear grandpa as I read quotes from him and descriptions of his actions,” Sundeen said. Sundeen attended the old West High School in Minneapolis for the 1968-69 school year and after school he would go to visit his grandfather, who lived a few blocks away. “That’s when I really got to spend more one-on-one time with him,” Sundeen related. “I wish he had told me more about the strike. It was his interest to talk with me about the issues of the day…I heard more from him about issues of the day than his history. Sundeen recalled his grandfather debating issues with his father. “They had some real discussions – they remind me about a lot of the discussions today,” he says. 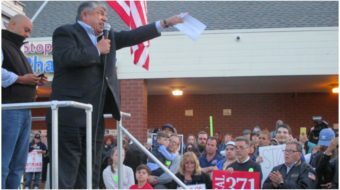 Sundeen, like his sister, is a member of SEIU Local 284 and works for the Hopkins School District. 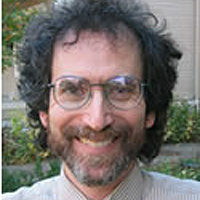 He also is a member of the Twin Cities IWW. Both Sundeen and Leighton have been involved in planning events for this year’s 80th anniversary of the 1934 Teamsters strikes. 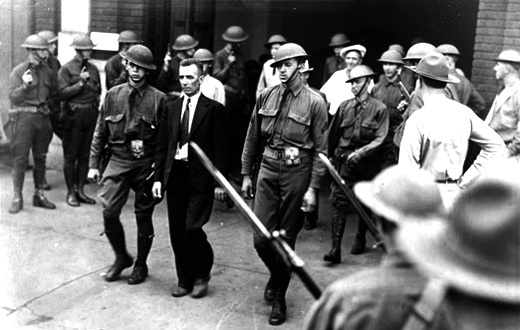 Photo: On August 1, 1934, the National Guard raided strike headquarters and arrested Vincent Dunne and others, but backed down and reversed the actions soon afterwards. Photo from Minnesota Historical Society.